Lately I've been reading through N. T. Wright's commentary on Colossians--which has been chock-full of really brilliant insights--and I thought I'd share a bit. slander, speech which puts malice into practical effect... and filthy language, words which, either by their foul association or their abusive intent, contaminate both speaker and hearers. All such things are to be put away from your lips: one cannot always prevent angry or hateful thoughts from springing into one's head, but they should be dealt with firmly before they turn into words. It is not 'healthy', as is sometimes supposed, to allow such thoughts to find expression. It is certainly healthy to recognize and face up to one's own anger or frustration, and to search for proper and creative ways of dealing with it. But words do not merely convey information or let off steam. They change situations and relationships, often irrevocably. They can wound as well as heal. Like wild plants blown by the wind, hateful words can scatter their seeds far and wide, giving birth to more anger wherever they land. The Church Fathers have come up several times in my recent posts on sola scriptura, and--though they've been popping up on this blog pretty consistently for over a year now--I feel like it's time to address some concerns that readers may have about them. Before that, though, maybe a definition is in order. The Church Fathers are those men (yes, this group is basically entirely male) whose writings made up the bulk of Christian teaching and doctrine for the first several centuries of the Church's existence, from the early 100s and on. These are the ministers and theologians who represent the "Tradition" of the Church: their works have countered heresies, encouraged the Church in times of persecution, been subject to centuries of pious study, and guided God's people in interpreting the scripture throughout the history of the Church. Some of these were martyrs, some were monks, some bishops, others philosophers. Many were saints. Names like Augustine, Ignatius of Antioch, Athanasius, Origen, and Jerome come to mind. These men have, to varying degrees, shaped the Church over the millennia, laying the foundation for the churches of today. If you would like to know my take on the authority of the Fathers, I'll just point you to my earlier post, "why not sola scriptura?". That's not an issue I want to take up here. Instead, I want to offer some brief responses to what are common misgivings that many modern Protestants--like the Southern Baptists whom I grew up among--have about the Tradition and the Church Fathers. Most of what I have to say is adapted from the introduction to a nice little book by an Evangelical scholar, Bryan M. Litfin: Getting to Know the Church Fathers: An Evangelical Introduction. Litfin addresses Evangelical distrust by going to the very issues that his students have struggled with over the years, and which he's had to confront. So, let's jump right in. The Fathers aren't "unbiblical." This idea, to me, suggests that someone hasn't read the Fathers. To be sure, 'many Protestants today associate the sayings of the church fathers with the nebulous concept of "tradition"... "the doctrines of men," as opposed to the divine revelation given in scripture,' and this is exactly where the Fathers go. But just because something is written by fallen human beings doesn't mean that it is therefore wholly wrong. These are Christian human beings, led by God the Holy Spirit... and they love the Bible. Scriptural quotations and themes echo throughout their writings. As Saint Athanasius put it so well, the scriptures are "the fountains of salvation, that they who thirst may be satisfied with the living words they contain. In these alone is proclaimed the doctrine of godliness. Let no man add to these, neither let him take [anything away] from these." These men do nothing other than apply themselves to scripture, in hopes of thereby proclaiming the truth of God in their own words. The Fathers were not Roman Catholics. Before the Protestant Reformation in the 16th century, there was no such thing as the "Roman Catholic Church." There was just the catholic Church (the word "catholic" just means "universal"), which included all Western Christians, and whose head was the Pope in Rome. Most of the Fathers were writing before the Pope really rose to power, and none of them would understand themselves to be anything other than catholic Christians. To try and dismiss the Fathers as Roman Catholics is just silly history. The Church in Acts is on the left, then about 1400 years of dismal failure, then we see the effects of the Reformation on the right. This is probably a pretty natural assumption to make for Protestants--after all, the idea was that the Church had been corrupted through papal abuse and was in dire need of 'reforming'. But the Reformers did not include the Church Fathers in this estimation of Church history. The late-medieval Church of the 16th century was in need of reform; the Fathers, like Augustine or John Chrysostom, who lived and ministered after the Church arose to power in the Roman Empire in the 4th century, were revered and relied upon by Luther and Calvin. This is partly due to the above two points. These three points were taken from Litfin, but they've also been confirmed for me through experience. I've found the Fathers to be an indispensable source of wisdom and guidance as I've seriously studied scripture and given thought to my faith over the last few years. I hope that others might give them a chance and find the same. And of course, the best way to form an opinion about the Fathers is to just read them and see for yourself. To anyone thinking of dipping their toes into the writings of these brilliant and godly men, I highly recommend St. Athanasius's On the Incarnation, with an introduction by C. S. Lewis. This is a fantastic little volume, and really accessible... the Lewis introduction doesn't hurt my opinion of it, either. If anyone would like to share your experience of getting to know the Church Fathers--good or ill--I'd love to hear about them in the comments. From the BioLogos blog comes Would You Like Fries With That Theory? Karl Giberson, a "science-and-religion scholar" (whatever that means) has written this interesting and, I thought, entertaining post for BioLogos. Giberson apparently shares my healthy respect for experts. Any kind of experts. Check it out--it's certainly worth the read. None of the Protestant Reformers ever used the phrase "sola scriptura"--which is Latin, by the way, and it usually means 'only the Bible is our authority'. None of the Reformers used this phrase, but it's an idea that's usually credited to them. I don't think that's fair, as you know if you saw my recent post on sola scriptura, but that's the popular perception. In the church environment I grew up in, this was the real legacy of the Reformation. We were sola scriptura people to the core. So why not? Why don't I affirm this idea that 'only the Bible is our authority'? Well, beyond the obvious point that scripture itself doesn't teach any such doctrine, I have several reasons, really, but I think that here I'm only going to go into two of them that have proven pretty central to me as I've given all of this thought over the last few years. First, let's look at the Bible itself. "What's the most important page in the Bible?" My brother likes to ask it this way, and I think it's a pretty good approach. We'll scratch our heads over the question for a while. 'Well, John 3:16 is on page 760 in mine...' 'Oh, the Resurrection is on 712.' For some people, maybe it's page 1. That one gets a lot of press. Page 895 has the final "Amen", which is probably pretty important. I find myself leaning another direction: I think the most important page in my Bible is page vii, the Table of Contents. 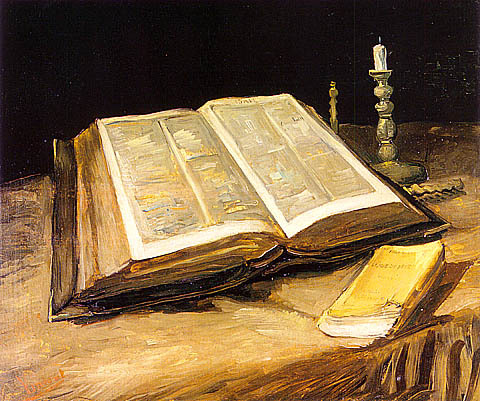 After all, there are 66 different books in our Bibles--and how do we know which books? How do we know what is and what is not the canonical Word of God, affirmed by God's people for centuries? The simple fact is, there's nothing in the Bible that can answer that for us. Instead, to answer this all-important question, we have to look at the Table of Contents. Why is this so important? Because if scripture is the only authority, then we finally don't know what we can even label as scripture. Here's the natural question to ask next, which for many of us has never even crossed our minds before: well who the heck did decide what's in the Bible? Was it Jesus? Paul? Peter? Well... no. It wasn't any of them. In reality, for 300 years, the Table of Contents hadn't been written yet. The first list recording the 66-book canon that Protestants use today that has been preserved was written by St. Athanasius, around 367, more than 300 years after the Church was born. There was certainly a kind of consensus in the Church before this over which books were to be treated as authoritative and which were not. Nevertheless, the formation of the canon--the clearly defined set of books that is the Bible--that we have today has a long backstory. Books like Revelation and James were in question for a few hundred years. Other gospels, like the Gospel of Thomas or the Gospel of Judas, tried to gain authority. Some early heretics even tried to throw out the whole Old Testament! The Table of Contents we have today wouldn't read the same if not for the efforts and influence of men like Irenaeus of Lyons, Origen, or Athanasius. Thus, every appeal to the authority of scripture is necessarily an appeal to the authority of the Church. This suggestion will bother a lot of modern Protestants, especially those of the Baptist or Non-denom varieties. It shouldn't. The New Testament speaks very powerfully of the authority of the Church: 1 Timothy 3:15 calls the "church of the living God" "the pillar and foundation of the truth." There are actually no statements in the Bible that strong concerning the authority of scripture itself. But I'm not simply appealing to the Church as my authority. The Church can only speak truth because of God the Holy Spirit. Here is my second reason: ultimately the Spirit must be the foundation of any claims to authority. My trust in the Church's decisions regarding what is to be considered canonical scripture is a trust in the guidance of the Spirit. This is the Spirit of truth whom Christ promised to his disciples: "he will guide you into all truth" (John 16:13). This is a promise that I take seriously, and indeed we all must take it seriously if we are to trust in any Christian message. It is this Spirit who inspired the authors of the New Testament (as well as the Old--2 Peter 1:20-21). It is the same Spirit who guided the Church Fathers as they battled heresy and gradually affirmed the Table of Contents of our Bibles. Now, I believe that scripture, as canonized by the Church, is the most perfect source of inspiration available to Christians in any and all times. But I also believe that the Spirit has spoken throughout history, and we ought to be vigilant for the voice of the Spirit. Returning to the Reformers for a minute, I think Calvin's understanding of the relation of scripture and the Holy Spirit is useful here: "the Spirit goes before the Church, to enlighten her in understanding the Word, while the Word itself... tests all doctrines." The scriptures cannot be read without the Spirit, nor can we make claims about the Spirit without reference to the scriptures. In keeping with this, whereas the authority of the Church Councils and the Fathers had always been assumed up until Calvin's time, he grants to them a qualified authority: "although... Fathers and Councils are of authority only in so far as they accord with the rule of the Word, we still give to Councils and Fathers such rank and honor as it is [right] for them to hold under Christ." I think this is the appropriate Christian stance towards the Church Tradition. To say that it has no authority at all is to confine the work of the Spirit to a couple of decades after the ascension of Christ and to ignore the realities of the formation of the Biblical canon. Yet the work of the Spirit in the Tradition must be in harmony with the inspiration of the scripture--so scripture can serve as a litmus test for the authority or inspiration of any teaching of the Fathers of the Church. Now, frankly, I'm not really hoping to force the Tradition on all the good Christians I know who are living faithfully by earnestly and expectantly poring over the scriptures, applying themselves to the texts and applying the texts to themselves. What bothers me is the disdain often poured on the Tradition in churches that I have come from. We aren't all going to read the Fathers, but we must all be ready to listen to them. The readiness to dismiss anything at all that is not the Bible as worthless, merely the thoughts of men, is to forget the the Holy Spirit was given to lead men into all truth, that the Church is indeed the pillar and foundation of the truth. When we refuse to listen to the wisdom and faith of the Church, we refuse to listen to the Spirit of God who has been at work through the Church. That is why I am not a sola scriptura person. That attitude forces us to ignore God-given counsel--given for the edification of the Body and for the establishment of right doctrine. It forces us to extinguish a light given for all of us as we read and hope to grasp and realize the truths of our faith that are found in the scriptures. We are already trusting the Spirit and listening to the Church every time we acknowledge the canon of scripture in our Table of Contents. Why aren't we willing to do more? Growing up I was always told that the Bible forbade gambling. Now that I'm grown and I've read the Bible... I'm fairly certain that isn't actually true. The 'gambling verse' is just not in there. Nevertheless, I don't support gambling, and I found a man who sees the issue in much the same way that I do. The following is a quotation from Erasmus of Rotterdam, a 16th century Christian writer. 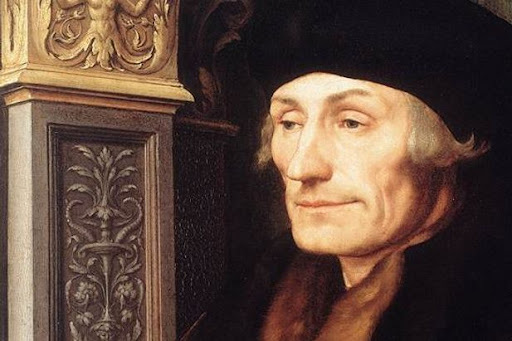 Erasmus actually remained Roman Catholic as the Protestant Reformation broke out, though he did sympathize greatly with many of the Reformers' concerns. He simply wasn't willing to sacrifice the unity of the Church. He's also pretty well know as a Christian humanist--he's sometimes called the "prince of the humanists", in fact--but keep in mind that this is a far cry from modern, secular humanism. Throwing dice cost you a thousand gold pieces in one night, and meanwhile some wretched girl, compelled by poverty, sold her modesty; and a soul is lost for which Christ gave his own. You say, what is that to me? I mind my own business, according to my lights. And yet you, holding such opinions, consider yourself a Christian, who are not even a man! If I came away with any suspicions that the young earth creationists might be wrong, it came from my developing an appreciation for Biblical interpretation, not from the Biology lab. Secular science didn’t turn my head. I learned that the people waving the Bible around weren’t necessarily treating it with the respect it deserved... many of my evangelical and fundamentalist brethren were not willing to let the scriptures be what they were or to let them speak their own language. The latter piece is a bit less sensitive, but well said all the same. This piece was prompted by the recent happenings--that I was until now wholly unaware of--at Reformed Theological Seminary, where respected evangelical Old Testament professor Bruce Waltke was forced to resign after suggesting in an online video that the Church needs to take a new approach to the appraisal of scientific data concerning evolution. I think these are both worth reading (though they're both relatively long) for those of you interested in or perhaps struggling with the issue. The top post by iMonk, especially, may be helpful to readers for whom this is still a very difficult topic. If anyone by now is still unsure as to where I stand on these questions and is interested, I would point you to this post from about a year ago on wardrobe: Happy Birthday, Charles Darwin!